Is There an Animal in My Chimney? Help With “Chimney Animals”! So, you are sitting with the family in your living room… when all of a sudden you hear a noise coming from your fireplace or in your chimney. Maybe it was just leaves, right? You light a fire and you hear a sound and the panic of something trying to get out…what is going on?! Well, you just may have a critter taking up residence in your flue. The real question is what type of animal can get into your chimney? And… what can you do about it? 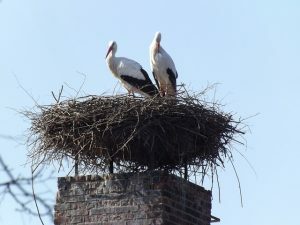 First and foremost, usually the only way an animal can get into your chimney is if you do not have a chimney cap. All things considered, these are very inexpensive and a must have for any homeowner with a working fireplace. In addition to stopping animals, the cap also prevents debris and water from getting into the chimney and causing potential structural damage. But, first, let’s figure out what is in that chimney! Possibly flying creatures, such as bats, owls and a variety of other birds, would be more than happy to take up residence in an open chimney. If an animal entered the flue while the damper was open and it is now closed, you will more than likely hear wings’ furiously flapping away as it tries to figure its way out of this entrapment. 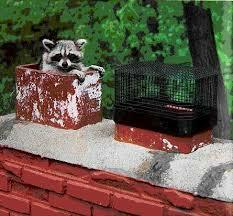 Raccoons often use chimneys to get out of the cold and will nest in there if they can. Unlike many other types of clawed creatures, raccoons are usually able to get up and down the chimney quite easily. On the other hand, animals like squirrels can also get into the chimney, but have a quite a challenge getting back out. You will often hear panicked scratching sounds as they try to figure their way out. Make sure to close all doors in your home, try to create some sort of ramp up to the nearest window, (for squirrel to exit), and make sure there is no other noises in the home, (as you wouldn’t want to startle the squirrel further). Another thing, is to put down a sheet outlining the path the animal will take to exit so your floor/furniture doesn’t get soot on it. Very carefully place a light cardboard box over the bird (you can also use a cloth too), and then gently slide some cardboard under the box and quickly let the bird outside. If the bird takes advantage of the fireplace doors being open and gains access into your house, open as many windows and doors as you can and have a couple of people ready with a sheet tied between two broom handles to gently guide the bird outside.